Video editing is a bit tough than image editing. There can be various reasons behind editing a video like you want to delete some sections of it, you want to fill special effects, to make your video more attractive, to add some background music etc. Magisto is such an app that can help you in editing your videos. It is available for both iOS and Android. Magisto ranked first in the list of Top 10 Video Editing Apps. We will be discussing about the features and facilities offered by Magisto on Android however, features of the iOS are almost same as of the Android version. Let us see how Magisto can help us. Magisto Video Editor is developed by Magisto. This amazing app is available for free in both Google Play Store and iTunes. It’s a great app that automatically converts video clips and photos into beautiful and attractive edited videos. 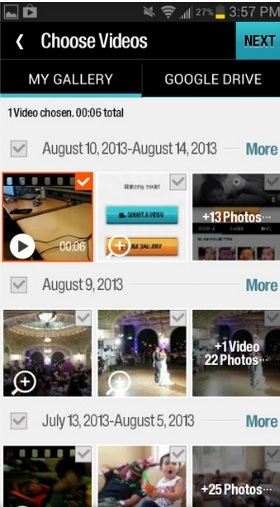 With this app, you can convert any rough mobile footage to a polished video. Whenever we go for a party or during celebrations we shoot videos with our smartphone and keep them as memory for lifetime. We also show these videos to others. Wouldn’t it be great to convert those memorable footage to a more attractive and polished form. The first thing is that you don’t need to be a professional video editor to edit videos using Magisto. You can do amazing editing with this app even if you are doing video editing for the first time in your life and have no idea of how all this is done. Magisto is a magical tool that automatically converts your videos to finished ones. At the home page of this app you will find two large buttons. One for selecting videos or photos from your gallery to make movie and perform editing and other button enables you to shoot a video in real time. You can choose existing videos from your phone gallery or from the Google Drive. If you choose to shoot a video then it goes to the app-recorder which can switch between front camera and rear camera. Each time you start and save a new video clip the app saves them to the drawer. You will find all your captured videos in the drawer. You can delete any of them if you don’t like them. You can select videos from gallery and cloud storage. Magisto supports all standard video formats so you don’t actually need to be worried about compatibility issues. Once you are done with picking up videos to combine and edit then Magisto starts working over them. It has a special emotion sensing technique that makes your movie a the right sort of emotional response. You can add music or sound tracks from your phone or from the Magisto’s library of licensed music. This is how you end us making an amazing video. Magisto is equipped with a lot of interesting features. Its emotion sensing technology combines all the best parts of video. 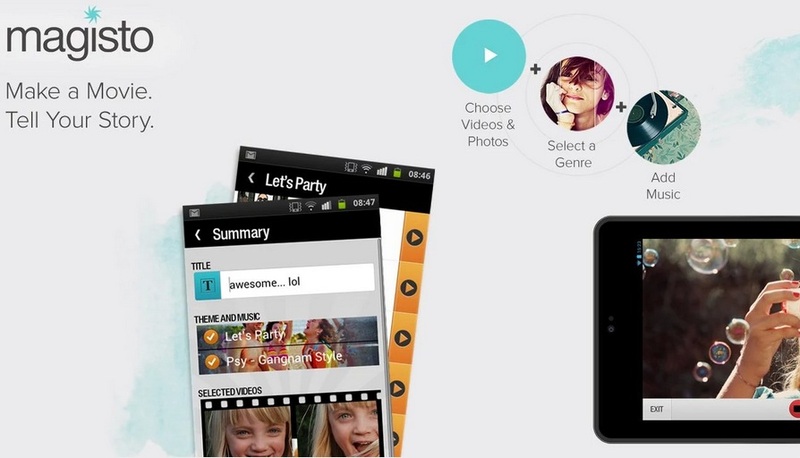 It has social media integration, you can share you videos with friends on Facebook, Twitter, Tumbler and Google+. It has automatic video stabilization, variety of filters, transitions, special effects, etc. 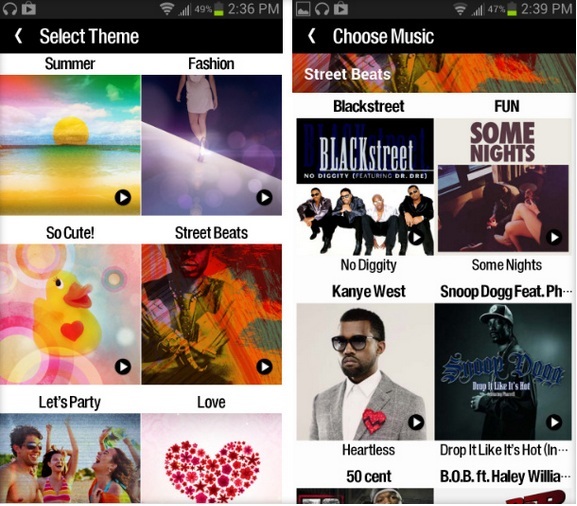 You can select your favorite themes in different categories and add your favorite music to your video. Magisto is an effective app in making your videos into nice movies. The app also comes in premium version. Although the free version offers decent features but you can make only up to 1 minute video with this for free. Also, only twelve themes may not be enough for some users. One more drawback that I found is that you need to browse your gallery to select your videos and photos. It doesn’t have any option for only videos or only photos. Suppose you have thousands of photos and video files then selecting from them becomes a tedious job. This video picker tool is annoying at times. Overall the app is very nice.